About the Artist: An Early Association with Bucks County and the Love of the Delaware River. John has been an artist all his life. Born in Trenton, NJ, he won an international poster contest as a teen and was presented the first prize award by entertainer Steve Allen. In his late teens, he was selling illustrations and cartoons to national sports and consumer magazines. His painting ability was first noticed by his high school art teacher who landed John a full art scholarship. A large Delaware River painting measuring 12 x 16 feet entitled They Dug Too Deep, won first prize in his home town painting contest. It depicted a prehistoric winged dragon re- awakened from his long slumber by the dredging taking place at the time to deepen the river. But that was only the start of his love affair with the Delaware River. He studied painting and commercial art at the School of Industrial Arts under Ben Elliott, John Slovak and Elizabeth Ruggles. The school was only several blocks away from the rivers edge which always fascinated the young artist. He met Hazel Herman a publicist for Trenton Trust Bank then owned by Mary Roebling and located directly across the street from the school. At 21, John had his first show at a private exhibition held at the Roebling Mansion hosted by Mrs. Roebling. She was his first painting buyer. In early 1970s, John and his wife Susanne moved to a stone farm house on Windy Bush Road in Bucks County not far from the river in New Hope where their daughter Karla was born. 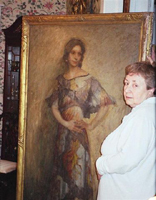 ( Also an artist, Karla has her studio at the Banana Factory in Bethlehem, PA.) It was living in New Hope for many years and the influence of the Pennsylvania Impressionists that first inspired John to develop his original style of contemporary impressionistic painting. His early association with Ben Badura enabled him to recognize, as well as purchase several paintings by now well known early New Hope artists including paintings and frames by Badura. Living in Bucks County for many years, the Stingers became close friends of Mayor Jim Magill , Lilias Barger concert pianist/ artist, Bud Swayne, an antiques dealer /collector, and businesswomen Penny Sandor. Jack Wallace, then the head of Pratt Institutes Portrait Department in New York, and a close neighbor, painted individual portraits of the Stingers in !978, now included in Susannes growing art collection. It was during this time that Susanne first recognized and collected paintings by Laurence Campbell whose work was just starting to be seen in Lambertville but not fully appreciated nationally until recently. 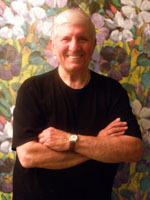 While working for several large American corporations as an award winning advertising creative executive and a New York based ad agency for over 30 years, John continued to study and spent several years training with nationally known Bucks County landscape painter Robert Seufert. He credits Seufert for teaching him the importance of painting proper values and that each landscape has its own unique story to tell. Most recently, John returned from Los Angeles where he waited four years to study with internationally known realist Jeremy Lipking. Lipking, a master of figural painting also teaches at the prestigious California Art Institute and only takes a very limited number of students. As a result, John is including more figures in his paintings that add a new dimension, and character to his work. Stinger specializes in Pennsylvania, New Jersey and New York landscapes, river and snow scenes painting primarily in oils on location but usually finishes his work in the studio. He has traveled extensively through out the US and Europe always looking for those special places to paint. To keep his mind stimulated he often travels to Vermont and next year he and Susanne will visit Jackson Hole, Wyoming to paint the Snake River and the Grand Teton Mountains. He also is an author. His book about antiques collecting was published in 1992 and has become a collectible. Professionally, John is a member of the Mid-Atlantic Plein Air Painters Association, The American Artists Professional Association, The Allied Artists Professional League, The Somerset Art Association and the Bucks County Arts and Cultural Council. (He was also featured on TEMPO, a PBS Channel 39 television program that presented his involvement with Lafayette College and their Community Outreach Art Program.) Buyers of his work include corporations, institutions, interior designers and individual collectors. Johns studio is situated on a pristine hillside overlooking an open valley of farmland, flowering trees and a winding stream. His devoted Cody, a charming black and gray Schnoodle is always at his side.